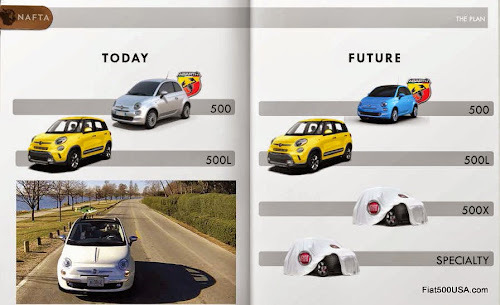 The Fiat brand outlined its business plan for the next five years today. Below are a few notable quotes and the full business plan for your reading.
" Logic and magic are Fiat's key attributes"
Fiat aims for 1.9 million global sales in 2018, up from 1.5 million in 2013. Fiat's goal is for 100,000 North American sales in 2018, double its sales in 2013. Fiat 500X arrives US Fiat Studios beginning of 2015. Roadster built in joint venture with Mazda. Not listed in presentation, but sources say expect substantial enhancements for the Fiat 500 over the next few years. Below is Fiat's 2014 - 2018 business plan, presented today, May6, 2014. Below is a question and answer conference held after the presentation of FCA's Five Year Plan with Sergio Marchionne, CEO of FCA and John Elkann, Chairman of FCA.